Do you have a stamp that you reach for over and over? 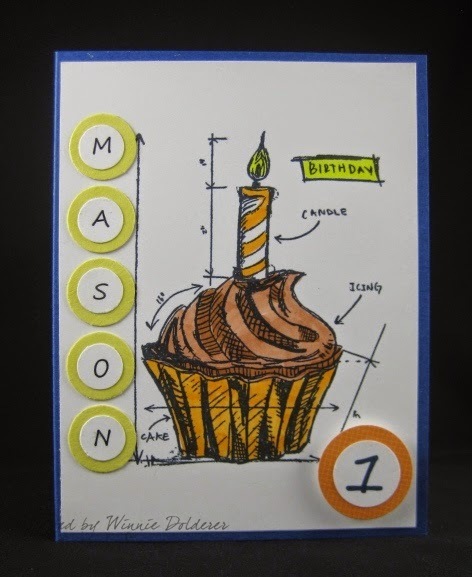 For me it is the cupcake stamp by Stampers Anonymous! As you know, I love the Blueprint stamps, but this one is the one that I use the most. I needed to make a little boy a card for his first birthday, and the single candle was just perfect for the occasion. I have been enjoying the change of season here in New York. I am enjoying the cooler weather and all the Fall outdoor fun! My husband and I have been to some local apple farms, our local arboretum for their Fall festivals and this weekend we will be attending an Oyster Festival. They have a lot of vendors there who sell their crafts, so it is right up my alley, not to mention all the delicious food! Thanks for visiting today! I hope to get into my craft room next week and share some fun with you soon! This is so cute. Love the giant cupcakes and the way you have personalized it for Mason. Great job. Great--Great Card. I love the colors! This is adorable. I love your layout and fabulous coloring!